After ISIS burns Jordanian pilot alive - and the UAE pulls out of airstrikes over it - US military rushes to compensate. The US military has deployed aircraft and troops to northern Iraq to boost its ability to rescue downed coalition pilots, after a Jordanian airman was captured and killed by jihadists in Syria, a defense official said Thursday. "We are repositioning some assets into northern Iraq," a US defense official told AFP. The move is designed to shorten the response time needed to reach pilots who end up in territory held by the Islamic State group, officials said. Search-and-rescue crews had been based in Kuwait, but officials said Wednesday the military was reviewing where its hardware and specialists were located following the loss of the Jordanian pilot. The redeployment came as US aircraft on Thursday escorted Jordanian warplanes over Syria for dozens of retaliatory air strikes against ISIS. American F-16 and F-22 jets provided security to Jordan's fighter planes on the strike mission while US refueling tankers and surveillance aircraft provided additional support, defense officials said. The United Arab Emirates, fearing for the safety of its pilots, reportedly had raised concerns about search-and-rescue resources with the Americans, urging them to redeploy some V-22 tilt-rotor Osprey aircraft to northern Iraq. US officials suggested the move of some search-and-rescue teams to northern Iraq would include helicopters but not necessarily Ospreys, an aircraft that takes off like a chopper but flies like a plane. The UAE pulled out of air strike flights in December, shortly after the Jordanian pilot was captured by ISIS after his F-16 fighter jet went down in eastern Syria. The UAE has indicated that the suspension of its participation in the air campaign would continue until the Osprey aircraft were moved to northern Iraq, according to the New York Times. ISIS terrorists posted a grisly video Tuesday showing the Jordanian airman, Maaz al-Kassasbeh, being burned alive. Apart from the UAE, Bahrain, Jordan and Saudi Arabia take part in US-led air raids in Syria, which began in September. Australia, Belgium, Canada, Denmark, France, the Netherlands and the United Kingdom participate in the air campaign in Iraq, which was launched on August 8. 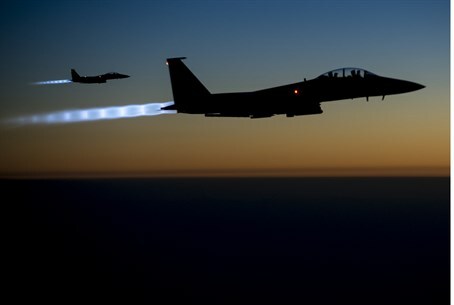 The United States plays a dominant role in the air war, named "Operation Inherent Resolve" - carrying out at least 80 percent of the raids, according to officials.